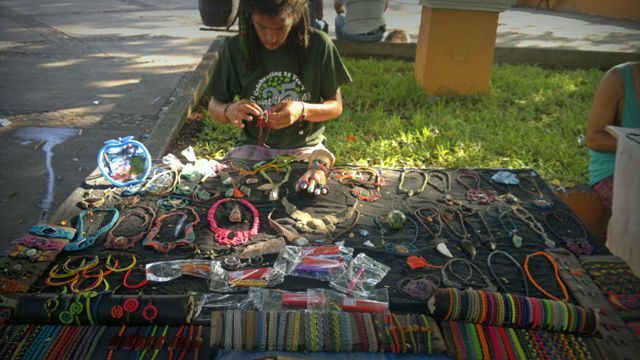 It is not the first time that I approached and talked to those people in the street with interesting hairdo and get up “a la Bob Marley”, making intricate hand-made bracelets, necklaces, rings, and sell them to people passing by. With their improvised table, their finished products are definitely an eye candy and attract people. Personally, I love those stuff. Simply because every piece is unique and carefully handcrafted to perfection. You will notice that it is an art in another form. The artistry, quality, time, and effort poured to create a masterpiece is impeccable. Plus, their prices oftentimes are negotiable and you can even customize the design of the item you like on the spot. Furthermore, talking to them is always like seeing a new perspective when it comes to vagabond, wanderlust, nomadic lifestyle. A lifestyle that is certainly I can’t picture myself completely, but maybe I have a dash of it in me when opportunity to travel comes along my way. I can’t imagine myself living in a backpack and thinking where to stay next. But I’m always fascinated how they can sustain themselves while and always on the go, their stories of the road, their craftsmanship and how they connect with people. I find them interesting. This time, I talked to this guy who right away noticed that I’m not from Guatemala and I’m asian. He gave me a vibe that he has been to many places and mingled with other nationalities. He speaks good spanish, not slang, nor gibberish, in a sense that I easily understood every single word he said and not trying to connect the dots of what he is trying to imply. He still go to school apparently, not sure how he does studying in a very transient schedule (must be tough or maybe not). And, surprise, surprise, he got an Iphone. I guessed you can call it modern-day nomads. I found out where he came from and the places he wandered. I enjoyed our conversation more when he started sharing some of his travel adventures especially to those places that I’ve been too before. 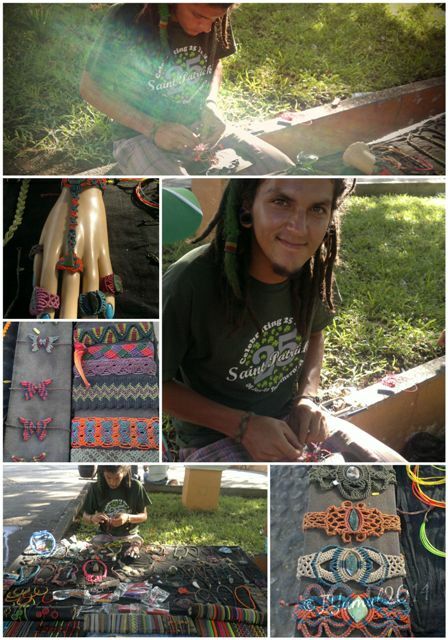 He showed me some weaving techniques and asked him how he got those beautiful stones he uses for his stuff. He said from his friends all around the world, given to him. Some are from Brazil, Mexico, Guatemala, Honduras, to name a few. That adds more to the character of his products. He also mentioned his next destination, his next adventure, interesting plan! The exchange of travel stories, travel tips, inside scoops and random talks, made me realize that if we put our guards down a bit, just a little bit, you’ll learn something new from other people. To listen to their stories, you can understand things and correct wrong impressions. That, it is indeed a small world after all. Every time I talk to people like him, it reminds me to do the things you love to do, that everybody will always have an opinion about you, but, what matters most, is that, if it will make you happy and you don’t do any harm to others, DO it. Never mind those lousy comments. So next time when you hit the road, and you see someone selling artisanal things, stop for a while. Talk to them, maybe you’ll learn one thing or two. Maybe, you’ll look at things in another way or appreciate another way of life. Those look like some very nice bracelets! Thanks for this post and for sharing.